Wilmington, North Carolina is one of those places that you’ll want to keep coming back to. The town has a laid back atmosphere with great eating and shopping opportunities. Situated right on the coast with white, sandy beaches, Wilmington is always growing and becoming more and more of a great family destination. Wilmington is surrounded by great fishable waters including freshwater lakes and rivers as well as inshore bays and estuaries and of course, phenomenal offshore fishing. The area is a fishing hotspot year round, but when it comes to the summer months, the offshore fishing is hard to top. Best of all, it’s great for the whole family. The mahi-mahi shine throughout the summer months and can be caught in great numbers. These beautifully colored blue, green and yellow fish are one of the most colorful fish you’ll find. Their colors have been known to change and their colors’ intensity fluctuates depending on their mood or feeding habits. Unfortunately, their color fades almost immediately once brought aboard the boat. When paired with the right tackle, they put up one heck of a fight that involves long runs and high flying acrobatics. They tend to travel in schools of the same size and usually caught by trolling bait or artificial lures. They can also be found near the surface around floating objects like logs or floating seagrass mats. Pitching topwater or jigs can be productive in these areas. Once one takes the bait, it can ignite a feeding frenzy where anything you throw in the water will surely get hit! This can make for some exciting fishing! 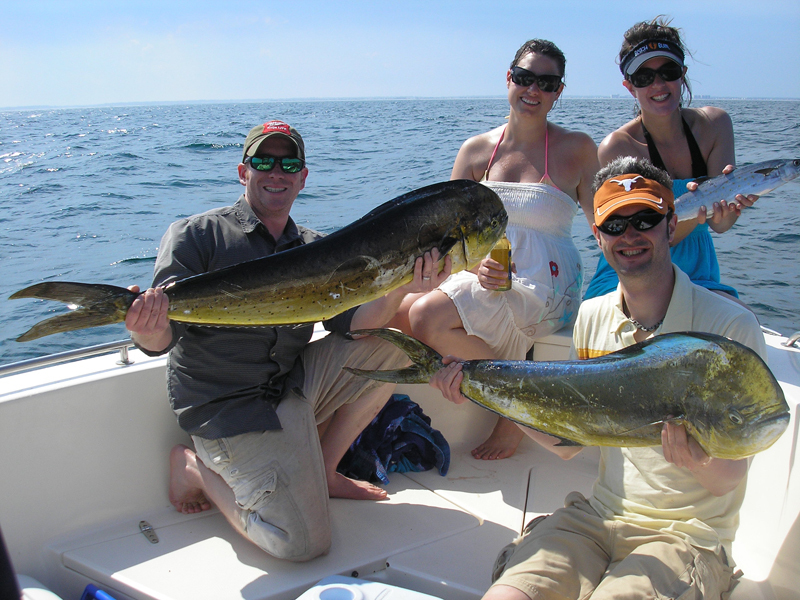 Mahi also makes for great table fare and is an excellent fish to fill the cooler with. They have a firm, white meat that go really well in any fish taco recipe. Mahi-mahi isn’t the only fish taking the summertime stage here off the banks of Wilmington, North Carolina. Yellow and black fin tuna and sailfish are also abundant this time of year. Fishing wrecks and reefs for grouper is also a good during the summer months. Book a trip with Captain Mike Hoffman for your next offshore fishing adventure and put some fresh seafood in the cooler! Be sure to bring the whole family!